You see, the Running for Scott 5k holds special meaning to us. It’s a race that raises money for adapted trikes so kids with special needs can ride a bike. It’s the reason I started running, and it’s the race Justin runs with Jayden. But this year, Jayden outgrew all of our running strollers. One special needs jogging stroller is about $900. We have one coming through the Megan Weisenbach foundation, but it hadn’t arrived in time for the race. Justin couldn’t see himself running it without Jayden, so he offered to volunteer instead. I didn’t know Justin had told Jen, so I thought nothing of it when Jen told me there was a family at Laremont that wanted to order a jogger like the one we found and asked me for the link, so I sent it. A few years ago they surprised us with an adapted trike for Brooklyn when they were dropping off Jayden’s. 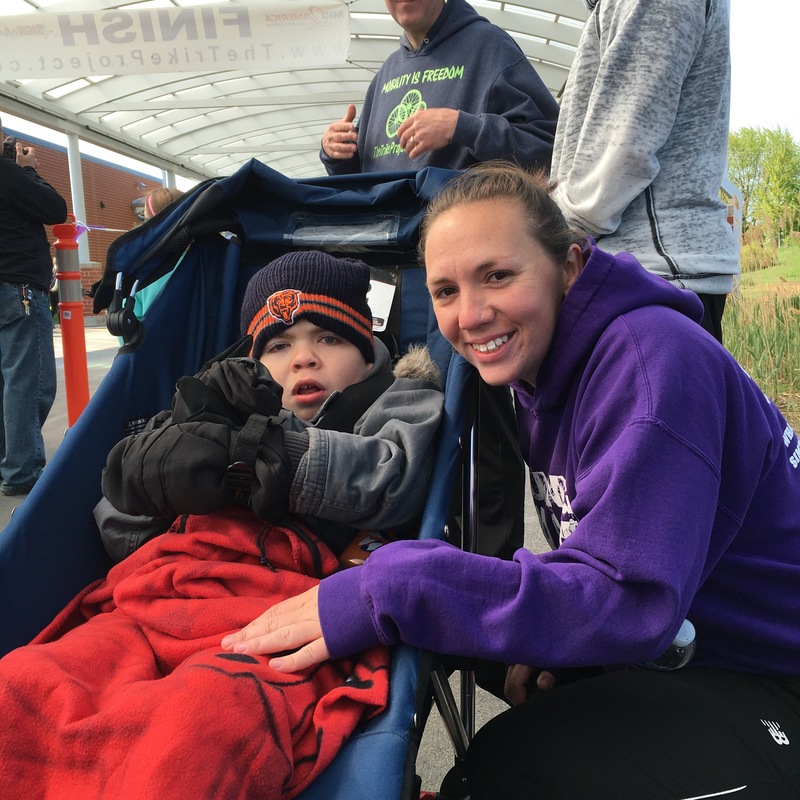 And on Saturday, they surprised us all with a special needs jogging stroller for Jayden. I opened the door, and the big blue beast had a sign on it that said, “mobility is freedom.” And Jayden and Justin finished that race 5th overall-together. Thank you Liz and Jen, for the amazing gift of mobility and for allowing us to create a special memory at the race. You both are so generous. We love you! I can’t wait to share a picture when Brooklyn’s jogger arrives–except that will mean I’ll have to push her when I run now-yikes! Learn more about the trike project here.